282 South 5th Street [Curbed]: Midwood Investment and Development has plans for a “13-story, 82-unit rental apartment with 26,000 square-feet of landscaped outdoor space” at 282 South 5th Street in Williamsburg. Morris Adjmi is designing, and with demolition complete — and permits now under review — construction is imminent. 10-44 47th Avenue [Brownstoner Queens]: A four-story townhouse is rising at 10-44 47th Avenue in Hunter’s Point, between 11th Street and Vernon Boulevard. Rebar is up to the second floor of the seven-unit building, which is being designed by Michael Kang. 42-60 Crescent Street [The Court Square Blog]: Permits for a ten-story, 40-unit residential building have been approved at 42-60 Crescent Street in the Citibank area of Hunter’s Point. The permits specify that the building will be “44,006 square-feet of residential space with 2,309 square-feet of ground-floor commercial space.” Demolition of the previous one-story structure has been completed, and vertical progress is in the not-too-distant future. 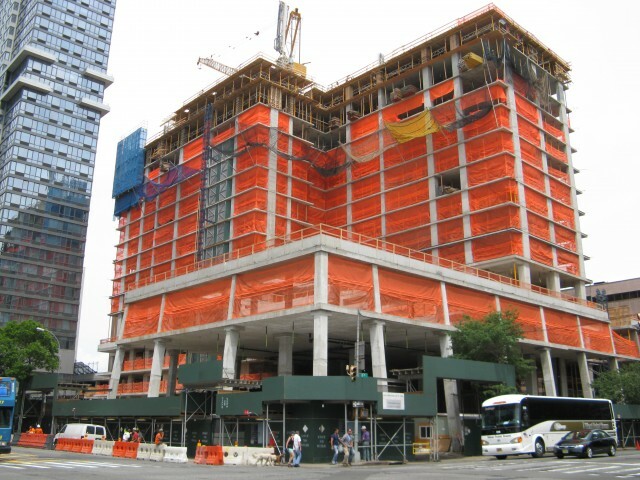 106 Haven Avenue [Curbed]: The 14-story Columbia University Medical Center’s Education Building is taking shape at 106 Haven Avenue in Washington Heights. The building has huge ceiling heights, and a wacky, futuristic design thanks to the architectural minds of Diller, Scofidio + Renfro. Currently, steel looks to be poking into the third floor, and the building is expected to be completed in 2015.